Since I decided a short while ago to start writing my long promised book (ok, that sounds too grand, the promise was to myself and I’ve been eagerly anticipating it for ages!!! ) I have ordered a couple of new commentaries. I have to confess that I have a bit of a thing for books … especially hardback, technical or academic tomes with crisp pages… better still if they’re full of funny symbols. Anyway, my book will be about Genesis 1-3 so the books I’ve ordered are two new commentaries on Genesis. I’m not short of a commentary or two on this area but these two commentaries had been long hankered after and now I had a good excuse. 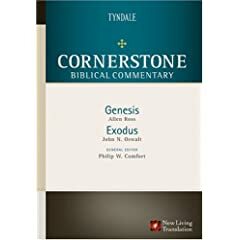 The first is the Cornertsone Biblical Commentary on Genesis & Exodus by Allen Ross and John N. Oswalt, edited by Philip W. Comfort and published by Tyndale. The base translation is the New Living Translation, which isn’t usually one of my favourites, but the commentary series is largely written by the same team who put the NLT together in the first place. It has a core belief in the Bible being the inspired Word of God, so that gives it credibility and substance. The layout is lovely, a pleasure to read, and a pleasure to hold (there’s really something magical about holding a brand new book and opening the pages for the first time!). Despite my love for Logos, I still can’t get away from the intoxication of a new book! Ah well. The other book I’ve got this week is an old favourite of mine – The New International Commentary Series. I just had to add The Book of Genesis: Chapters 1-17 (The New International Commentary on the Old Testament) to my library. Again, like the Cornerstone series, the NICOT series are beautiful books. Excellent layout inside to help you pour through the information you need quickly, but lovely to interact with physically too. Of course, this is all very superficial stuff. ‘Don’t judge a book by its cover’ and all that! And indeed that’s right. I just wanted to share my joy at receiving these tomes this week and with them the greater excitement of sitting down to read them. I’ve made a start on them both but there’s a long way to go yet. You can be sure that they’ll be making regular appearances in the footnotes of this blog.